I built a tattoo parlor for my Sims' town... and promptly realized I had no custom tattoos. Most of the tattoos available for download are tribal, and I am not in a tribe, so obviously the solution was to start making tattoos for my Sims. As with most things, I've already started to go overboard, but at least I got one set done already. These are mostly sea creatures with tentacles, hence the title. A few of them don't have tentacles, but, whatever, I tossed them in anyway. These are not "accessory tattoos," and thus require the Ambitions expansion pack. They are available for males and females, teen and up. I like the seahorse best. Are you going to do anymore? I'd love some butterfly tattoos. What I really need are some nice tramp stamps now that we can actually place them properly. Yes, I plan to do a lot more. In fact, I already have two more sets pretty much done! Kazuma's backpiece could be easily made into an accessory tattoo. To make it into an Ambitions tattoo is do-able, but I would have to fudge with the colors because Ambitions tattoos can only have four colors. It looks like a fun challenge though, so I think I'll give it a shot. If you don't see it in the next couple of weeks it probably means I ran into a problem and gave up. That would be awesome. But an accessory tattoo would be ok if you can't get the Ambitions type to work. As for the four color limit, I think if you do the belly of the dragon and the pointy scales at the top of the body in grey, it could work. Because then it would just be grey, black, red and yellow. All the white parts would just be transparent. I've been wanting his tattoo in the game for awhile now, but I just couldn't figure out how to make them myself. It just seemed way over my head. So that would be awesome if you could make it. Here's a bigger version of the tattoo if it will help. I absolutely love these tattoo sets of yours. 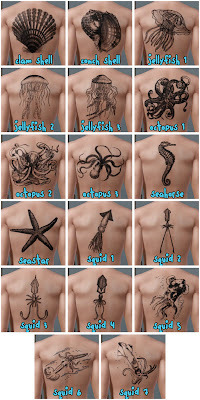 They are all things that I would actually get tattooed on myself. What mod do you use to get so many different locations for placement? Your tattoo parlor looks great. Ever consider packaging it and putting it up for download? Is there a site or a tutorial online that I can look at to learn how to make my own tattoos?